Editor’s Pick (PSL T20): Multan Sultans - Quetta Gladiators. Multan Sultans are probably humming the song, “nothing’s gonna stop us now’. And probably nothing is stopping them at the moment. Playing PSL for the first time, this team has exceeded all expectations - even their own - and has come on top in a fabulous way. And they have beaten the defending champions, Peshawar Zalmi, not once but twice. So, if anyone had called their first victory a fluke or beginner’s luck; they have put that thought to rest. 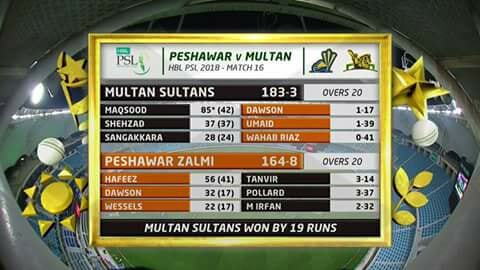 The Sultans have also met Quetta Gladiators before and has defeated them. Humiliated them, rather. Karachi Kings have a prayer of a hope right now of defeating the new kids on the block. Time will tell. Nothing more to say about them. Top of the table with nine glorious points. Has everything going for them. They will stick to their winning combination and winning ways. Second last on the table. Meeting the team that beat the defending champions twice. And has lost to them as well. The gladiators need to rethink their strategy if they want to progress in this tournament. They do not want to be stuck at the bottom of the table like Lahore Qalandars.